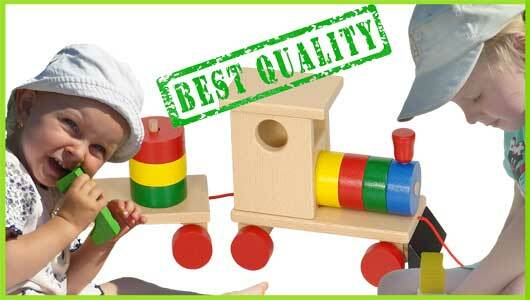 Most of our toys are made from beech wood, which is carefully selected and the processing is free of any chemicals. The wood is coloured and polished through a special technology (our own method which has been developed and improved over many years). Through using this method we achieve bright and pleasant colours and the paints do not obscure but rather highlight the grain of the wood. The flawless surface is water and scratch resistant. The high standard of quality is ensured by strict checks in every sector of the production. All products go through final checks before packing and exporting to the customers.